We are a group of folk passionate about market strategy and marketing. We do the work we do because we find it exciting, energizing and meaningful. And because we enjoy it so much, our involvement in it is 24/7, across categories, geographies and other assorted boundaries. Our minds are constantly ticking away, noting observations from our daily life and surroundings, gathering in information from media, secondary sources, and the independent research that we undertake. We believe that this constant engagement with society and markets enriches every project we undertake. Our blog is an attempt to bring some of these nuggets of information to you and ignite an interesting discussion. While we thoroughly enjoy the process of writing these blog posts, we enjoy even more the process of interacting with readers in the comments section, on Facebook / Twitter / LinkedIn, or even over a cup of coffee at our office, so do share your reactions to any post any time, regardless of whether it’s praise or criticism, agreement or disagreement. 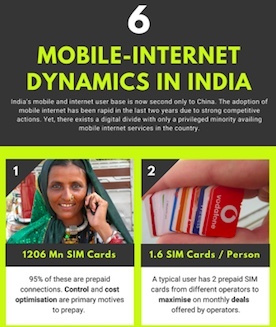 An infographic about mobile and mobile internet consumption in India. Are data and creative contradictory? Can they co-exist? The evolving OTC landscape and the changes in the self-medication habits of consumers, present an opportunity for pharma companies to participate in a sector that expected to grow at a healthy pace in the future. But to succeed at it, these firms need to come with an appetite to invest in communication and distribution.